When I was a kid, I accidentally broke one. That silvery powder made a mess of things. Mini Etch-a-Sketch toys are available at CVS. The sad thing is, the company that sells them, Ohio Art, does not make them in Ohio anymore. Like everything else, they are now made in China. 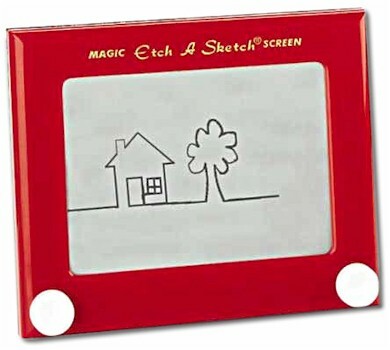 Some people appear to be able to do amazing work with an Etch-A-Sketch. Check out this link. Googling "Etch-A-Sketch art" will turn up others as well. Thank You for putting this in. I loved this as a child, trying to amke my name and drawing houses.